Each method varies in its permanency and benefits. At Virginia Surgical Arts, we offer both Juvéderm® injections and fat grafting for our patients. Patients of any age can benefit from lip augmentation. As long as you have realistic expectations and are getting the procedure for your own satisfaction, you will likely be pleased with the results. Juvéderm is a popular brand of lip filler that temporarily alters the size and shape of your lips. At Virginia Surgical Arts, we use Juvéderm® Ultra Plus XC for lip augmentation. The gel is made of hyaluronic acid, a safe and natural substance that already exists in our bodies and moisturizes the skin. Hyaluronic acid fillers are the industry standard and are preferred over collagen injections. Results last for a year, so you can avoid the hassle of appointments every three to nine months, as is common with other lip fillers. Better yet, the results are not permanent. If you decide you no longer want full lips, the hyaluronic acid will dissolve and be absorbed into the body. Or, if for some reason you change your mind after the injection, it is possible to inject hyaluronidase and break down the filler quickly. Another benefit of Juvéderm is that it works well for people with darker skin tones. Other fillers have been known to cause hyperpigmentation and hypertrophic scarring at the injection site. Another popular type of lip augmentation is a fat graft, otherwise known as a fat transfer or fat injection. The fat comes from your own body, typically from the stomach, hip, thigh or buttock. After extraction, it is purified and re-injected into the body. Injecting fat is similar to injecting a lip filler. However, you will need separate appointments or a longer appointment so your doctor can perform liposuction to collect the fat. You only need enough fat to alter your lips – about one or two syringes’ worth. There will be little to no change in the area where the fat is extracted since it is such a minuscule amount. Many people prefer fat grafting over fillers because the results last longer. At most, 50 percent of fat cells will be reabsorbed by the body over time, whereas fillers are entirely absorbed.2 The rest of the fat stays in the lip area for a permanent pout. This procedure also brings some patients peace of mind, as they do not want to be injected with a foreign substance. Because the fat comes from your own body, the chance of an allergic reaction is practically nonexistent, and it’s likely your body will accept the fat transfer. 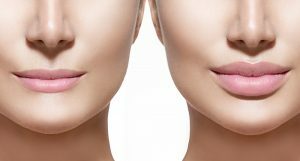 If you’re looking for a safe and simple way to enhance the look of your lips, consider visiting Dr. Sergio Vendetti at Virginia Surgical Arts. He offers several lip augmentation options, including Juvéderm injections and fat transfers, so you can get the perfect smile. Call (757) 430-7690 today to schedule your appointment.